Vitale, Caturano & Company (VCC) is a full-service CPA (Certified Public Accountant), business advisory and technology consulting firm. 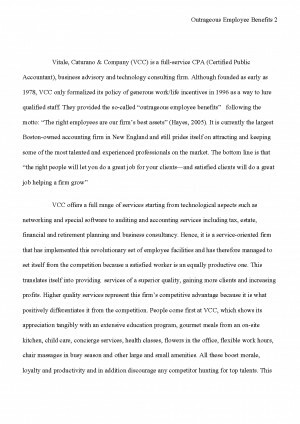 Although founded as early as 1978, VCC only formalized its policy of generous work/life incentives in 1996 as a way to lure qualified staff. 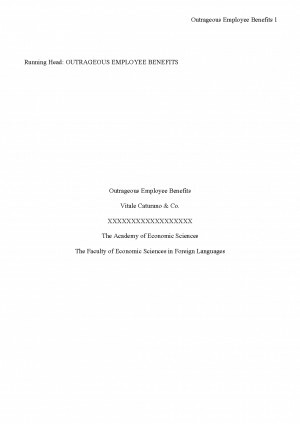 They provided the so-called "outrageous employee benefits" following the motto: "The right employees are our firm's best assets" (Hayes, 2005). It is currently the largest Boston-owned accounting firm in New England and still prides itself on attracting and keeping some of the most talented and experienced professionals on the market. The bottom line is that "the right people will let you do a great job for your clients--and satisfied clients will do a great job helping a firm grow"
VCC offers a full range of services starting from technological aspects such as networking and special software to auditing and accounting services including tax, estate, financial and retirement planning and business consultancy. Hence, it is a service-oriented firm that has implemented this revolutionary set of employee facilities and has therefore managed to set itself from the competition because a satisfied worker is an equally productive one. This translates itself into providing services of a superior quality, gaining more clients and increasing profits. Higher quality services represent this firm's competitive advantage because it is what positively differentiates it from the competition. People come first at VCC, which shows its appreciation tangibly with an extensive education program, gourmet meals from an on-site kitchen, child care, concierge services, health classes, flowers in the office, flexible work hours, chair massages in busy season and other large and small amenities. All these boost morale, loyalty and productivity and in addition discourage any competitor hunting for top talents. This is not an unrealistic fear because we are generally dealing with a very unstable labour market and surveys show that approximately 38% of middle managers in the US are currently looking for a new job( Swanda,2004) . This mobility is a danger particularly for the best in the business who search for and expect benefits proportional to their own performance. 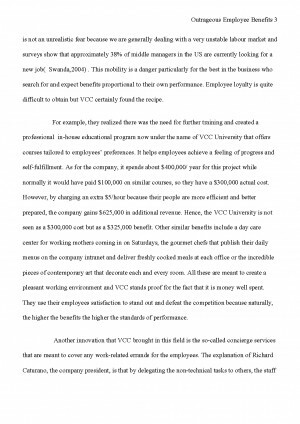 Employee loyalty is quite difficult to obtain but VCC certainly found the recipe. 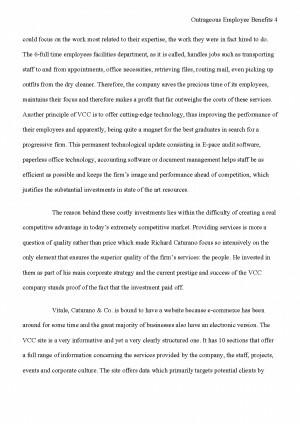 For example, they realized there was the need for further training and created a professional in-house educational program now under the name of VCC University that offers courses tailored to employees' preferences. It helps employees achieve a feeling of progress and self-fulfillment. As for the company, it spends about $400,000/ year for this project while normally it would have paid $100,000 on similar courses, so they have a $300,000 actual cost. However, by charging an extra $5/hour because their people are more efficient and better prepared, the company gains $625,000 in additional revenue. Hence, the VCC University is not seen as a $300,000 cost but as a $325,000 benefit. Other similar benefits include a day care center for working mothers coming in on Saturdays, the gourmet chefs that publish their daily menus on the company intranet and deliver freshly cooked meals at each office or the incredible pieces of contemporary art that decorate each and every room. All these are meant to create a pleasant working environment and VCC stands proof for the fact that it is money well spent. They use their employees satisfaction to stand out and defeat the competition because naturally, the higher the benefits the higher the standards of performance. Another innovation that VCC brought in this field is the so-called concierge services that are meant to cover any work-related errands for the employees. The explanation of Richard Caturano, the company president, is that by delegating the non-technical tasks to others, the staff could focus on the work most related to their expertise, the work they were in fact hired to do. The 6-full time employees facilities department, as it is called, handles jobs such as transporting staff to and from appointments, office necessities, retrieving files, routing mail, even picking up outfits from the dry cleaner. Descarcă referatul cu titlul "Outrageous Employee Benefits" cu plata prin SMS pentru 4 € + TVA. Plătești un referat și primești 2 (al doilea gratis).